A short drive down Indian Point Road and only one minute from Silver Dollar City, you'll find *Grand Crowne Resorts - Lodges at Table Rock*. 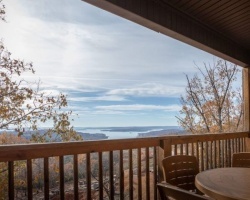 Delicately placed in the heart of the Ozark Mountains and designed especially for seclusion and relaxation, you and your family will find a restful haven in one of our 4-, 5- or 6 bedroom Lodges. Impeccably appointed with luxuries and distinctive touches that defy ordinary expectations, there are no finer luxury cabin-style vacation accommodations available in Branson. Price is negotiable. Ideal resort for a group of friends or family! Buyer May Receive A Title Fee Credit, Inquire For Details!